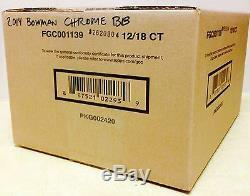 2014 BOWMAN CHROME BASEBALL FACTORY-SEALED 12-BOX HOBBY CASE. SEALED 12 BOX HOBBY CASE. Each Box contains Two Autograph Cards! Look for Kris Bryant Autographs! 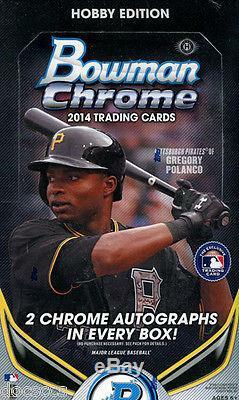 Listen up, Chrome fans: Bowman Chrome is new and improved! The 2014 edition has ramped things up by offering two autographs in every box! This year will debut a bunch of hot-looking inserts and parallels, such as the Fire Die-Cuts, Dualing Die-Cuts and Mini Chrome Superfractors. Bowman Chrome will also be incorporating cutting-edge stats and information courtesy of our new partnership with Bloomberg Sports. This product has reinvented itself and will not disappoint! Key Rookies: Xander Bogaerts, George Springer, Masahiro Tanaka, Nick Castellanos, Travis D'Arnaud, Marcus Semien, Gregory Polanco, Yordano Ventura, Kolten Wong, Taijuan Walker, Rougned Odor, James Paxton, Garin Cecchini, Billy Hamilton. Prospect & Rookie Autographs will have the following parallels. Refractor #'d to 500. Blue Refractor #'d to 150. Bubbles Refractor #'d to 99. Green Refractor #'d to 75. Gold Refractor #'d to 50. Orange Refractor #'d to 25. Carbon Fiber Refractor #'d to 10. Twitter-Blue Social Media-Graph Parallel - Players will sign with their Twitter handle #'d to 10. Red Refractor #'d to 5. Superfractor #'d 1 of 1. Autographed Printing Plates #'d 1 of 1. Featuring top prospects and Major League stars. Mini Chrome Autograph: #'d to 10. Mini Chrome DIE-CUT Parallel: #'d to 150. DIE-CUT Blue Wave Parallel: #'d to 99. DIE-CUT Red Wave Parallel: #'d to 5. Superfractor DIE-CUT Parallel: #'d 1/1. A vertical die-cut and red spin on the 2014 flagship Bowman Prospect design featuring top 50 Prospects and Rookies from in 2014 Bowman and Bowman Chrome NEW! Fire Die-Cut Atomic Refractor: #'d to 99. Fire Die-Cut X-fractor: #'d to 25. Fire Die-Cut Superfractor: #'d 1/1. Fire Die-Cut Refractor Autographs: #'d to 25. Fire Die-Cut Superfractor Autograph #'d 1 of 1. Horizontal die-cut featuring two top prospects NEW! Dualing Die-Cut Atomic Refractor: #'d to 99. Dualing Die-Cut X-fractor: #'d to 25. Dualing Die-Cut Superfractor: #'d 1/1. Bowman Continuity program #'d to 25. The Bowman Black Collection Violet Parallel #'d to 10. 1989 "Bowman is Back" Silver Diamond Refractor. This insert is a continuity program in all Bowman products celebrating the year that Bowman cards started to be produced again in 1989. 1989 "Bowman is Back" Black Diamond Refractor Autograph #'d to 15. AFLAC High School All-American & Under Armour All-American Game Autographs. Sequentially numbered to various quantities. The top veterans of MLB. These images are picked up from 2014 Bowman. First Year MLB subjects; cards will have the "MLB Rookie Card" logo. Rookie subjects will be shown with image variations. Top prospects who were not in 2014 Bowman. Prospect Error Card Variations NEW! Refractor Sequentially numbered to 500. Blue Refractor #'d to 250. Purple Refractor #'d to 150. Orange #'d to 25. Printing Plates #'d 1/1. Blue Wave Refractor Hot Packs. Red Wave Chrome Refractor Parallel #'d to 25. Blue Wave Chrome Refractor Prospect Autograph #'d to 50. Black Wave Refractor Hot Packs. Silver Wave Chrome Refractor Parallel #'d to 25. Black Wave Chrome Refractor Prospect Autograph #'d to 50. 18 Packs Per Box, 4 Cards Per Pack. But most of all, have fun and ENJOY LIFE. Please follow instructions to pay for your item(s). Rest assured that you will be handled with care and consideration; we have been in business for over 27 years! 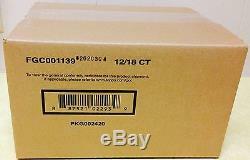 The item "2014 BOWMAN CHROME BASEBALL HOBBY FACTORY SEALED 12 BOX CASE KRIS BRYANT" is in sale since Monday, December 21, 2015. This item is in the category "Sports Mem, Cards & Fan Shop\Cards\Baseball". 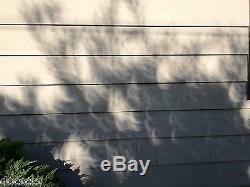 The seller is "docsccs" and is located in Campbell, California. This item can be shipped to United States, to Canada, to United Kingdom, DK, RO, SK, BG, CZ, FI, HU, LV, LT, MT, EE, to Australia, GR, PT, CY, SI, to Japan, to China, SE, KR, ID, to Taiwan, ZA, TH, to Belgium, to France, to Hong Kong, to Ireland, to Netherlands, PL, to Spain, to Italy, to Germany, to Austria, IL, to Mexico, to New Zealand, SG, to Switzerland, NO, SA, AE, QA, KW, BH, HR, MY, TR, BR, CO, PA, JM.